Feige Filling Technology Asia Pacific Pte. Ltd :: Type FPSB :: Feige Filling Technology Asia Pacific Pte. Ltd.
A pre-stack unit stacks two container rows one upon the other. 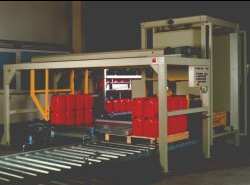 The push palletiser then pushes two rows each on the pallet. The pallets are dispensed and separated by an empty pallet magazine.